so when i was planning my monthly cocktail cupcakes, Hawkeye tweeted a vote option out - pink awareness themed cupcakes, or halloween themed? and halloween won!! Sami was the first to respond with a halloween vote, so i decided to embrace her favorite candies - candy corn and reese's. but the beauty of these particular cupcakes is that the choice is up to you. 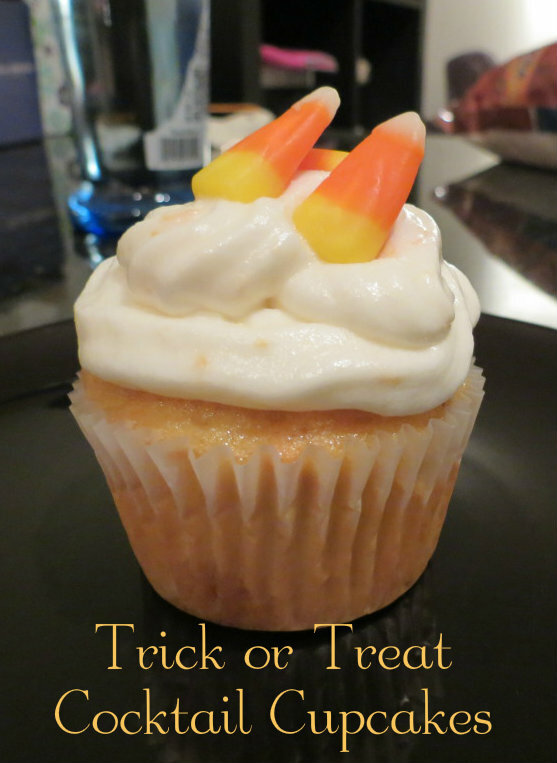 it's all about using what leftover candies and salty treats you have! you can use any salty snack (cheetos, doritos, pretzels, potato chips) and any sweet treat (milky ways, chocolate chips, caramels, raisins) and you don't even need to stick to one of each! and you just mix it into your favorite cupcake recipe - even a box mix like me. line your cupcakes tins and fill the cups just over 2/3 full. bake as directed on your box/recipe. the additional candy/snacks will not change the cook time. cream together 1 stick room temperature butter and 1/2 cup shortening until fluffy. mix in 4 oz of softened cream cheese. slowly add 4 to 5 cups of powdered sugar a half cup at a time, alternating sugar with first 1 table spoon lemon juice and then a total of 4 shots of marshmallow vodka. 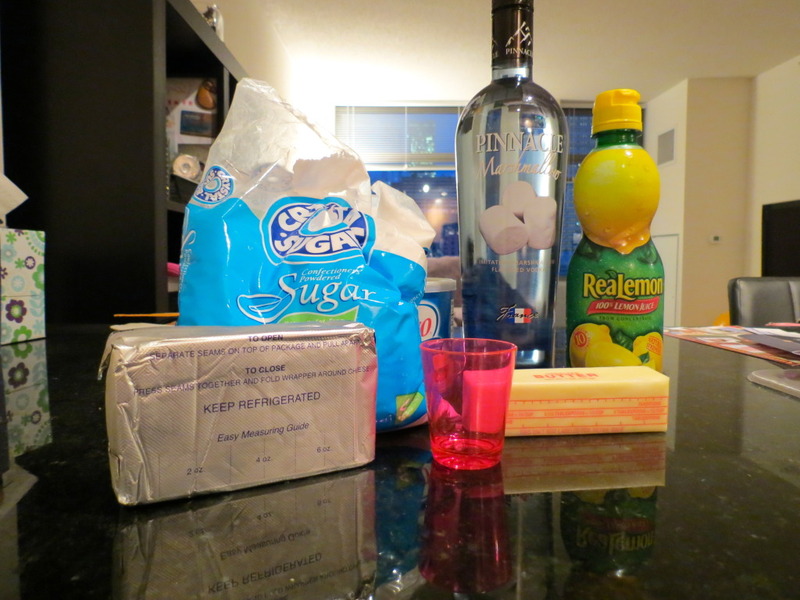 continue to add sugar until you have desired consistency, and add more lemon juice/shots if frosting is too thick, or to taste. 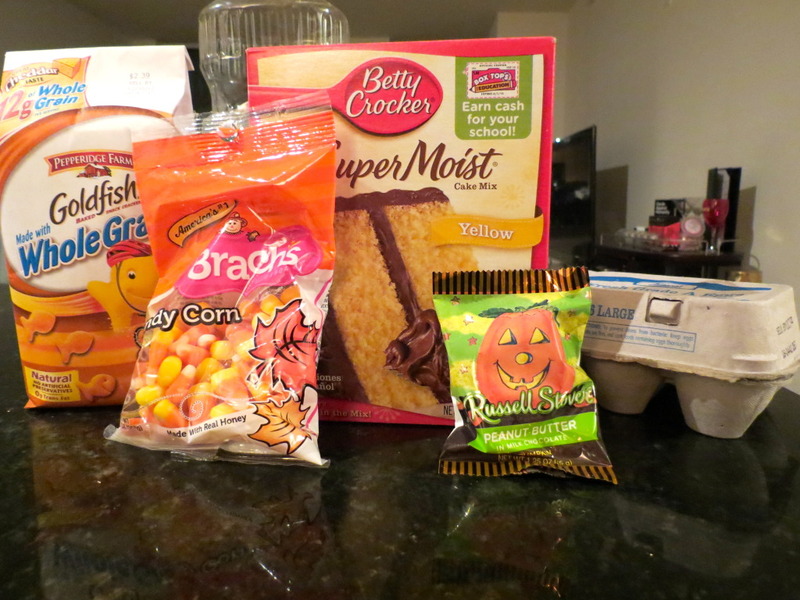 i added 1/2 a cup of crushed goldfish to the frosting because this frosting is very sweet. the bit of salt worked out perfectly! as did the hint of halloween orange, of course. 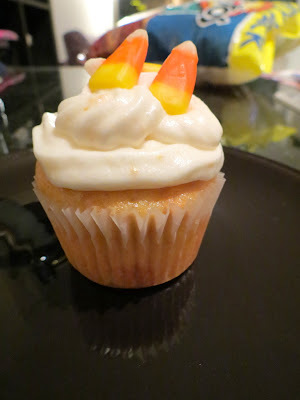 frost away and top with candy corn! of course i sound crazy, but i promise you these are delicious. what mix of treats will you try?! happy halloween! Love me some candy corns! These sound so yummy and I love that they can be customized! Woot woot! Those cupcakes look delicious!! I love that you make alcohol infused cupcakes. Love!! I want to make these. I MUST make them! They look amazing! I cannot wait to stuff my face. 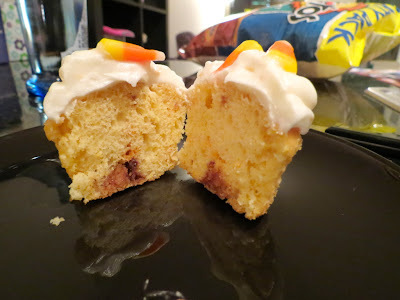 oh my gosh i must make these! yummy. YUM!I was curious where you were going with the goldfish. Very interesting! I would never have thought to put goldfish as a crunchy element in cupcakes, but now that you've done it I think it's probably the most brilliant thing ever. Looks so delicious!!! Great recipe! hmmm alcoholic cupcakes....(picture Homer Simpson's face here)...looks great!! So crazy, I would've never thought about using goldfish. I have to try this! !